Molded high-strength, glass-reinforced composite. Color: Black. Tip-to-root length: 26-1/4 inches. (Makes a 59” dia. prop including hub). Score lines provided ½” apart near tips for cutting to smaller custom diameters. All blades identical and interchangeable. Molded high-strength, carbon-reinforced composite. Color: Black. Tip-to-root length: 31 inches. (Makes a 66” dia. prop including hub). Blades can be cut for smaller diameter props. Low cost, accurate, easy to use digital propeller protractor to check, set, or change propeller pitch. Resolution and repeatability is 0.05 degree and the accuracy of the Angle Cube protractor is +/- 0.1 degree. Can also be used to measure wing incidence, rotorcraft blade angles, and aircraft ground angles as well as any other applications requiring accurate angle measurement. Click here to download Propeller Protractor instructions as a PDF. 3/16” aluminum plate. One-inch center pilot hole. Six, 5/16” or 8mm holes on standard Rotax 75mm bolt circle and 2 3/4” bolt circle. Molded high strength, glass-reinforced composite. Grooved faces provide precision alignment with blade base. Color: Black. (Two identical blocks per blade). Separate blocks required for each setting. Block angles from 8 degrees to 18 degrees available in 1 degree increments. Specify 2, 3, or 4 blade prop. Molded high-strength glass-reinforced composite with integral steel reinforcing plate. 6-1/2” O.D. Color: Black. Fits 1” dia. prop shaft. Accommodates most mounting plate bolt hole patterns from 2-1/4” to 3-1/4” dia. and ¼”, 5/16” or 8mm prop mounting bolts. Assembled hub is 2-1/4” thick. (Two identical halves per assembly). 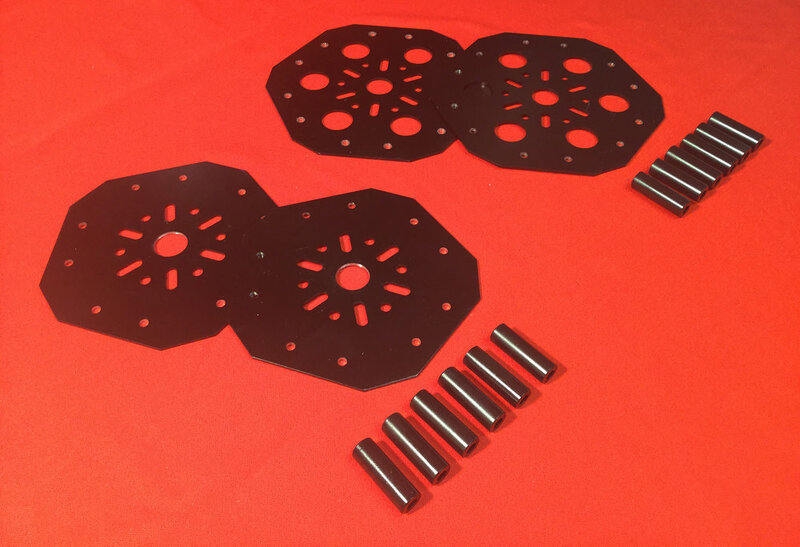 High strength steel hub plates for 5 and 6 blade props. Fits 1" dia. prop shaft. Six, 5/16" or 8mm prop bolts on a 2 1/4" to 3 1/4" bolt circle. Two plates per prop assembly. Six 5/16" ID x 5/8" OD x 1.85" long steel, tubular spacers required per prop assembly. Included with kit or sold separately. Six 5/16" ID x 5/8" OD x 1.85" long steel, tubular spacers for 5 and 6 blade hubs. Blade mounting bolts: AN4-26A (2-3/4” long). Washers: AN960-416. Lock nuts: AN365-428. (2-sets required/blade). Corresponding A/N5 Hardware is also available for Brolga Blades. AN4-24A (2- 1/2" long) bolts for 5 and 6-blade props. (Not required for 5/16” or 8mm dia. mounting bolts.) Stainless Steel. Set of 6 sleeves required if using 1/4" mounting bolts. 1/4" ID x 5/16" OD x 2 1/4" long. Kit includes a taper lock bushing and matching modified sprocket to provide the interface between keyed, straight shaft small gas engines and the Ultra-Prop. Also provided is a “crush” or backing plate, mounting hardware and key. Available for shaft sizes from 3/4" to 1 1/2". Click here to download the Prop Flange Kit instructions as a PDF. Prop Flange Kit with 6" diameter pulley for driving an alternator. This is a popular setup when a light bank is used for night fishing. Kit includes flange with pulley, taper lock QD bushing, two propeller backup plates, six tubular spacers, all hardware and key for straight shaft. Available in shaft sizes from 1" to 1 7/16". Click here to download the Prop Flange Kit with Pulley instructions as a PDF. "New" digital tachometer and hour meter. Universal model TT2A replaces the old 1C and 2C. Adjustable to accommodate various RPM firing modes. Faster update time and more features. Kit includes white polyester spinner, mounting bracket, and all extra hardware for installation. Specify Quicksilver MX belt drive type with 1/4 inch mounting hardware or Rotax gear drive with 5/16 or 8 mm mounting hardware. Learn more about ordering Ultralight Aircraft Parts and the Brolga Ultra-Prop from Competition Aircraft. Contact us regarding any questions or curiosities you may have regarding our products.